NetDeploy Global picks up where Microsoft leaves off on application deployment. One of the strongest features of Microsoft's Systems Management Server (SMS) is its ability to deploy software; but who says a good thing can't be made better? While SMS is very good at distributing software applications in a well-connected environment, it's less effective in an "extended network" with remote and mobile users, who often live outside the corporate firewall. NetDeploy Global for Microsoft SMS, from ManageSoft (formerly Open Software Associates, OSA) extends the software distribution ability of SMS with a number of attractive features aimed at achieving 100 percent success in enterprise-wide software distribution. With SMS claiming approximately 50 percent of the Wintel desktop management field, OSA wisely decided to integrate NetDeploy Global with SMS to leverage the SMS infrastructure. One of the main features of the NetDeploy Global for SMS client is its SmartPull technology. It provides the ManageSoft client with a number of "self-healing" capabilities, including the ability to resume an interrupted software installation; the ability to replace deleted application files with or without .msi files; the ability to ensure package integrity through the use of MD5 checksums to prevent viruses from propagating through software deployment; and the ability to keep a given computer at a desired "system state" with more than one designated software package. Further, the NetDeploy Global for SMS client can use either the normal SMS distribution mechanism or Internet protocols such as HTTP or FTP to get software to the desktop. This flexibility means traveling laptop users don't have to worry about having access to an SMS Client Access Point or Distribution Server when they connect to their offices through a VPN, a slow dial-up, or over the Internet; they'll still get the critical applications they need. Road warriors will even get their applications installed the next time they connect if their link goes down in the middle of the session. System administrators get a break, too. NetDeploy Global for SMS offers a fail-over server facility; the ability to throttle bandwidth during distribution; automatic detection of the nearest server so multiple distribution points can be utilized; the ability to limit download sizes along with full compression of all transferred files; accurate reporting information on software installations; and even a variety of methods to insure corporate firewall integrity in spite of remote clients connecting from who-knows-where. The NetDeploy Global for SMS client can either fully integrate with SMS and be managed through the SMS Administrator Console or be completely functional on its own in situations where it's not practical or possible to have the SMS client installed. In my company's mixed environment of SMS and non-SMS clients in both Active Directory and NT 4 networking environments, I consider NetDeploy Global for SMS to be a comprehensive and valuable solution for software distribution needs. 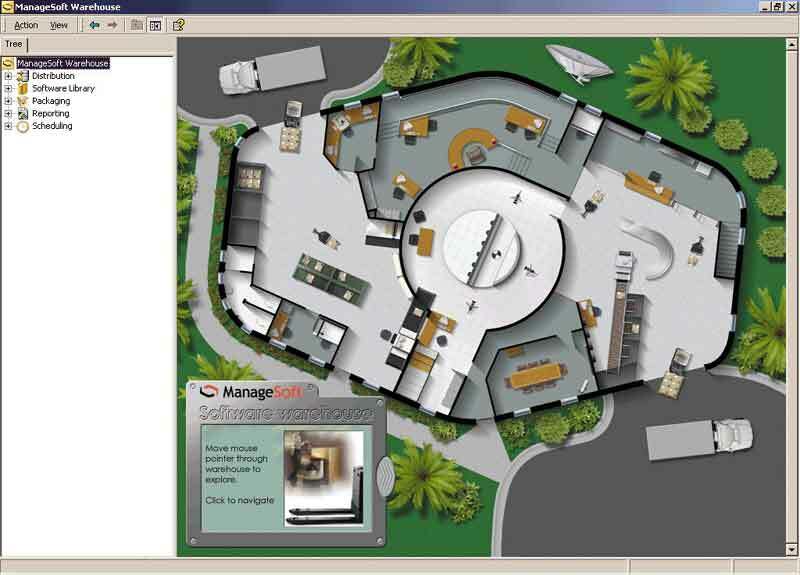 As we went to press, ManageSoft released a significant product update. The new version, dubbed ManageSoft 6.0, extends the software distribution focus to the creation of an entire virtual "software warehouse." This integrated package allows you to handle all software tasks from receiving a new release to reporting on which computers have successfully installed it, including testing and repackaging. Additional tracking and reporting features enhance already strong capabilities for license analysis, leading to potentially significant cost savings. You can tailor a variety of digital dashboard displays to the needs of management with as much or as little information as necessary. The new version includes a customizable user interface built as an MMC Console, as well as integration with Microsoft .NET technologies for key features. While not inexpensive, NetDeploy Global for SMS can provide that extra bit of flexibility and functionality to extend true systems management to every Windows desktop, especially for organizations with a significant remote/mobile user base, and/or a heterogeneous desktop and network infrastructure.